You make the realization that not everyone who purchases a hearing aid needs all the features that are included in $2,000 and up packages. Many of these packages may be overpriced for your needs. If you have any questions or concerns about your purchase, you can contact our office at 1-800-804-0434 or use the Contact Us form at the very bottom of this page. Instead of wasting thousands of dollars, you use our website to find a hearing aid that will work for your hearing loss. Below is our top in canal hearing aid that will be invisible to others. Make your purchase and feel secure that you have a 30 Day Money Back Guarantee. If the hearing aid doesn't work as well as you need for any reason at all, you get all of your money back. 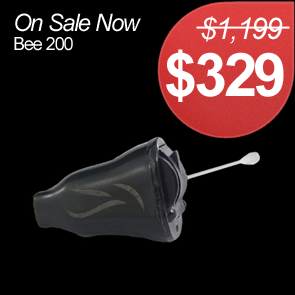 The Bee 200 hearing aid fits inside your ear to stay out of view from others. Our sale prices are available for only a limited time.